I make bowls in many sizes and variables. The most distinctive is the pattern I pierce along the rims and the unique shapes I actually cut into the rims themselves. I choose the open shape of the bowl, then design a pattern to fit that shape drawing from my impressions of flowers, leaves, animals or abstractions. 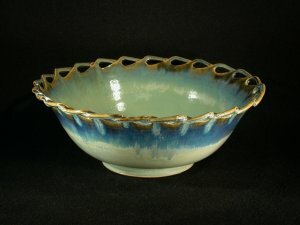 Some bowls come in a number of different colors and sizes. Others I choose the color and size as the best fit from my artistic point of view. I will be adding more to this category and at some time I will be retiring certain patterns. These beautiful flowers are one of the first bright faces of the spring. You, however, can bring spring into your home at any time. I have designed this bowl with three distinct groupings of daffodils, each with a different number of flowers. It comes in two sizes 10″ or 12″ diameter and several colors. Sea green (shown.) Sea green with a dark blue rim, aqua blue with a darker blue rim, lavender. The price is $150 for the 10″ and $275 for the 12″. It takes me about 6 weeks to complete an order. 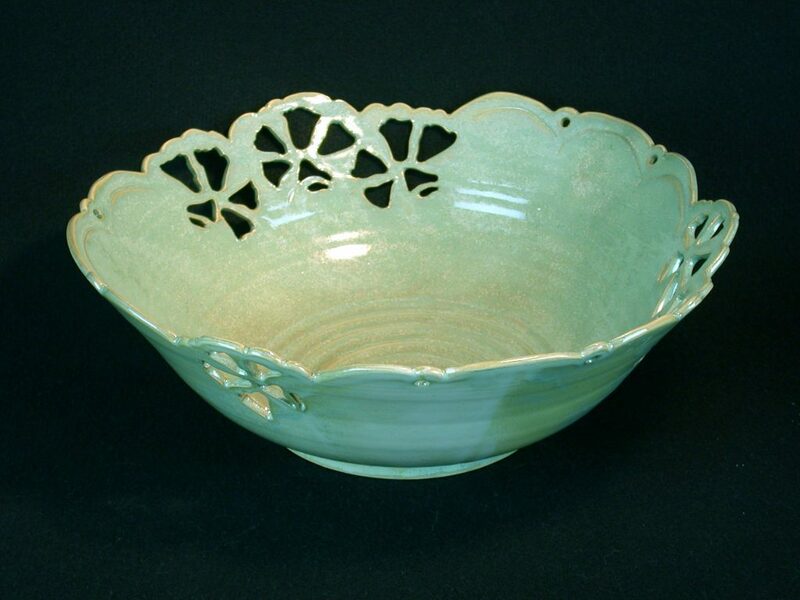 This lovely bowl is one of my most popular. I have carved the rim in the lotus pattern, but I added a second carving the give the edge a more three dimensional appearance. I then drew pedal lines down into the bowl to further accent this aspect. When I glazed it I add a dark blue color on the background pedal also to enhance this look. It comes only in one size, 12 inch diameter and one color, sea green, but the alternate petals are dark blue. Some tell me it reminds them of ginkgo leaves. 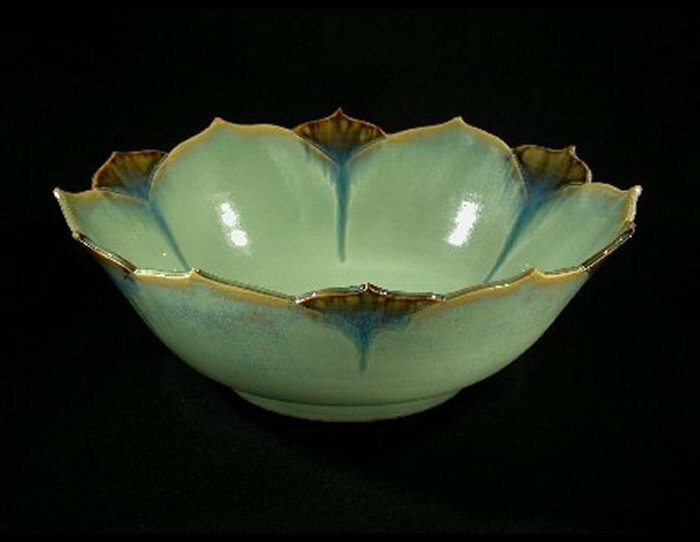 This beautiful bowl is stunning as a center piece on your sidebar or dining room table. 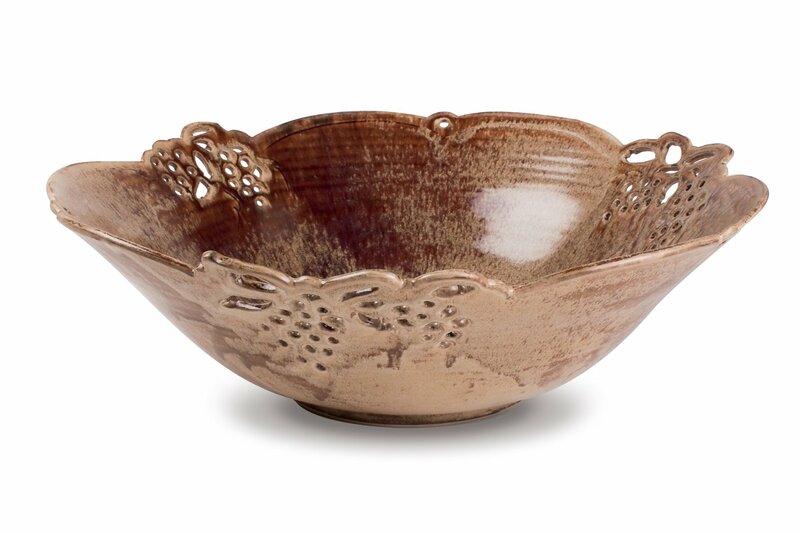 I have drawn grape vines leaves and pierced grapes in bunches in three clusters around this bowl. It is 14″ in diameter and just under 5″ in height. It come in this warm glowing glaze I call Desert Sand. Waves bowl with incised and folded rim. When I designed this piece, I wanted the three dimensional look in two facets. First the water droplet shapes and then cutting through the rim and folding the tip of the droplets behind the rim and securing them. With this bowl, in your mind’s ear, you can practically hear the ocean as the wave pattern flows around the edge of this beautiful bowl. Most popular is the 10″ diameter for $150. Available in three sizes. Medium 10″ @ $150 and 12″ @ 265. Colors: sea green with dark blue rim (shown here) and aqua blue with dark blue rim.